Action News was there when Jay Wright watched a replay of the three-pointer miracle. HOUSTON (WPVI) -- Action News was there when Jay Wright watched a replay of the three-pointer miracle. He and his family watched the replay with us late Monday night. It is one of the greatest finishes you will ever see. 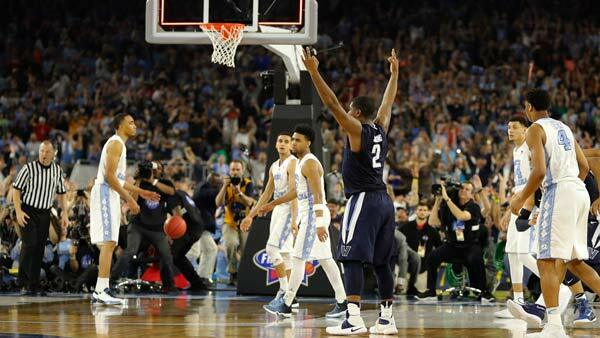 With no time left, Villanova's Kris Jenkins puts up a three-pointer. It is the first time in National Championship Game history that a team won at the buzzer on a three to become the national champions. The team cut down the nets in Houston, Texas after their big win. Villanova forward Kris Jenkins was asked if it had sunk in what he did on the last shot. He said, "It still hasn't. I love this trophy, and I'm not going to let it go for a while." Daniel Ochefu, Villanova Guard added, "It's a dream come true. I have no words. Just amazing, I'm glad I could share this time with my basketball family." Villanova guard Ryan Arcidiacona was asked what was honestly going through his mind. "Did that just happen? Is this real life? We just piled on him, and it was great emotion," said Ryan. Wright couldn't believe his eyes. Coach Jay Wright said, "Right now, I'm numb. I really am. It is a thrill, it is humbling to feel so fortunate with these guys." It's still hard to believe, but Villanova Wildcats are National Champions for the second time in school history. Now, it's time for the big parade.